A metering station is a complex and important process that needs to be very carefully controlled from a measurement perspective; it is after all a cash register that is responsible for accurately tracking how much product has flowed through each meter. Although the metering station may be built around the flow computer, it is the supervisory HMI that brings it all together and makes sense of the overall operation and manages the measurement process. Getting this critical component right is vital. 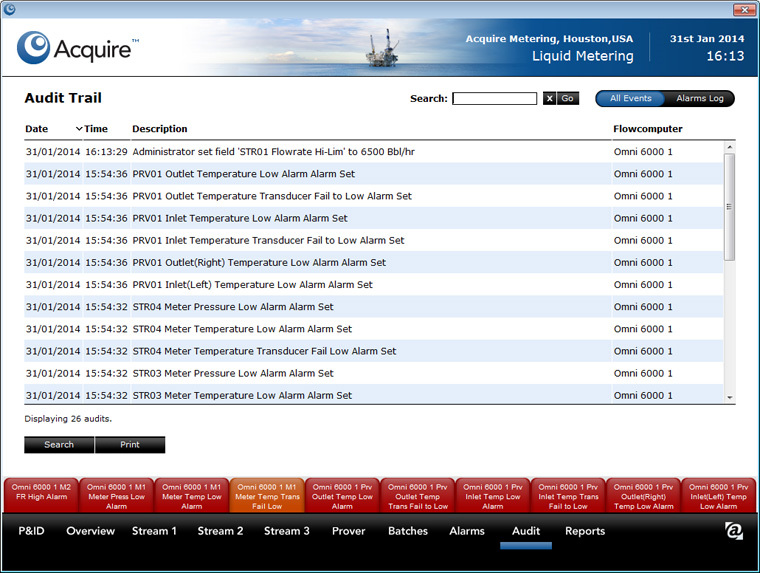 Acquire™ is a revolutionary metering HMI application that takes measurement control systems to the next level in terms of setup, features, connectivity and ease of use. 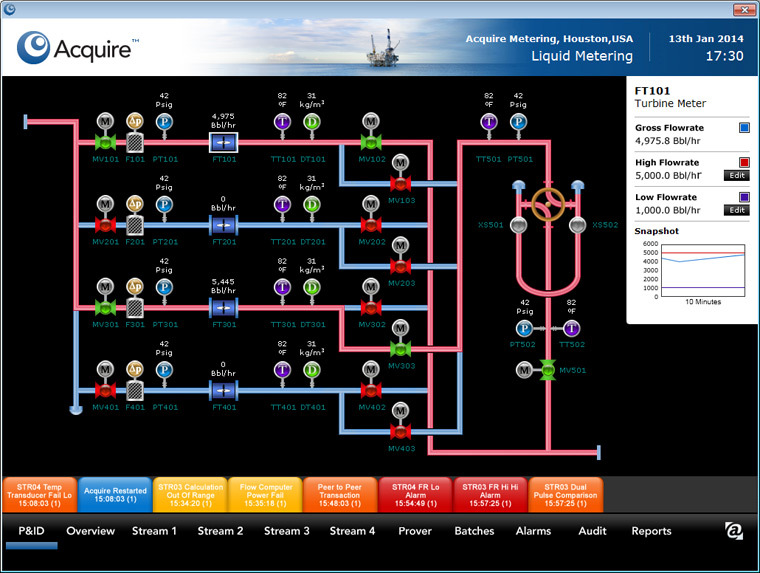 Acquire builds powerful HMI solutions to solve real world metering problems. Acquire provides a centralised view of the measurement process with a simple graphical user interface with all the necessary information to run the system presented on a single clearly laid out P&ID. It also allows the user to delve into more detailed aspects of the measurement process providing extended information directly from the flow computers, high resolution charts, alarms and audit trail events. Acquire can initiate a prove in the flow computer and track it all the way through to completion, collecting all the intermediate prove run data as it is generated. At the end of the prove sequence, all the prove data is downloaded and stored alongside the flow computer generated prove report in the database. This prove data can be passed into Approve™ for more detailed analysis. Acquire is also able to manage the batch process, scheduling upcoming batches, manage the currently active batch and then collecting all the batch data and report once the batch completes. 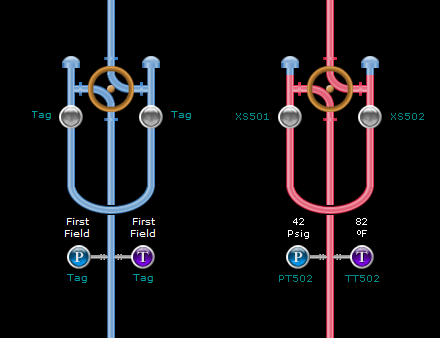 PLCs can also be connected to the system for real time control of valves and other instrumentation that are outside the traditional scope of the flow computer. 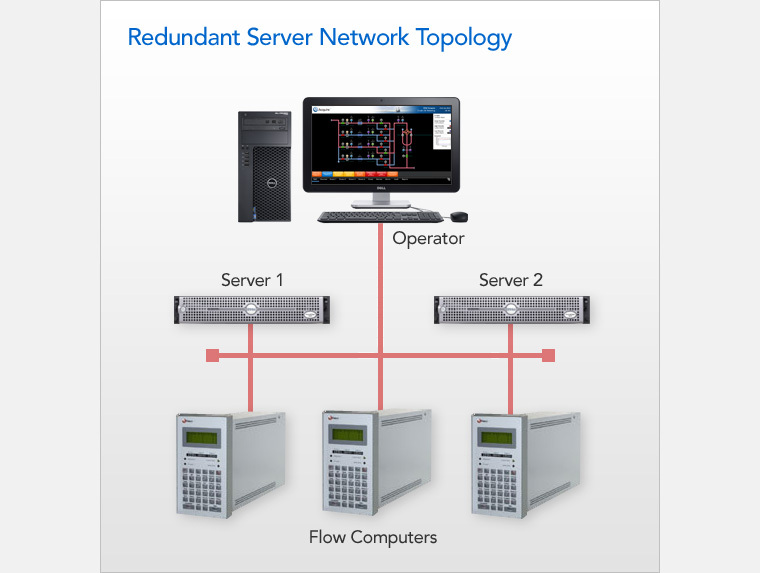 Acquire can provide maximum reliability and uptime with full support for duty / standby flow computers, redundant networking and redundant servers. Every report generated by the flow computer (e.g. daily reports, prove reports and batch reports) can be downloaded and stored in the database. These flow computer generated reports can be supplemented with Acquire’s own custom reports that can be professionally presented as high quality PDF documents. Although the HMI is the most critical part of the metering system it is also the most complex part and the hardest bit to get right. Acquire is provided as an out of the box solution that provides everything that is needed to provide a comprehensive HMI solution with no custom engineering or technical risk. 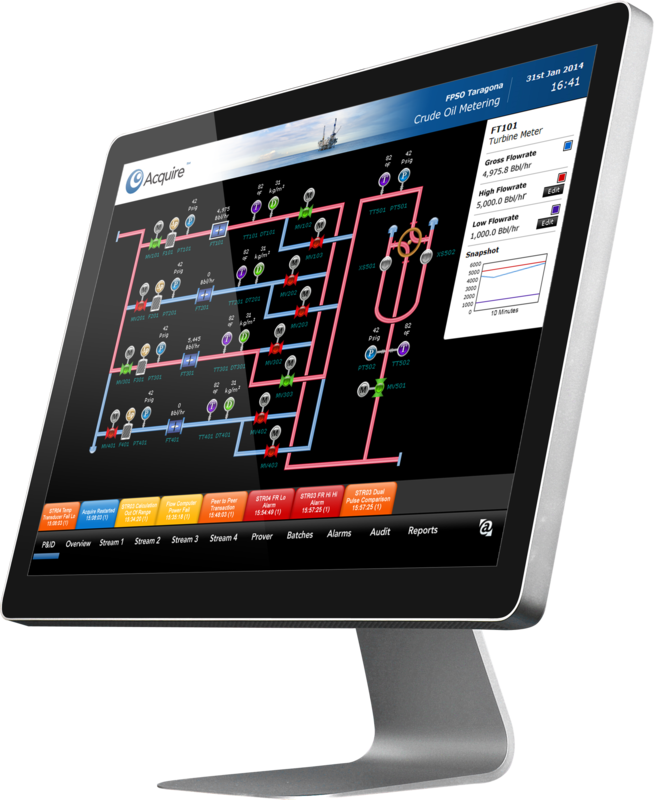 Graphically monitor the whole process in real time from the HMI in one clearly laid out and easy to read screen. Clicking on any device on the P&ID shows more detailed information about it along with a 10 minute chart snapshot. You can customise the P&ID with drag-and-drop ease. 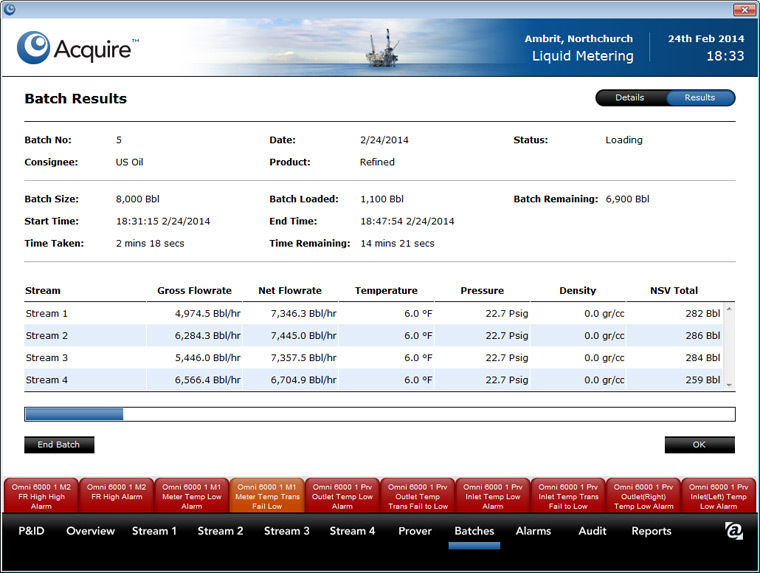 View up to date information in real time from the metering station in your browser from anywhere in the world. Make changes to the set points and limits and they will be immediately updated in the flow computer. This real time data is also recorded in chart format. 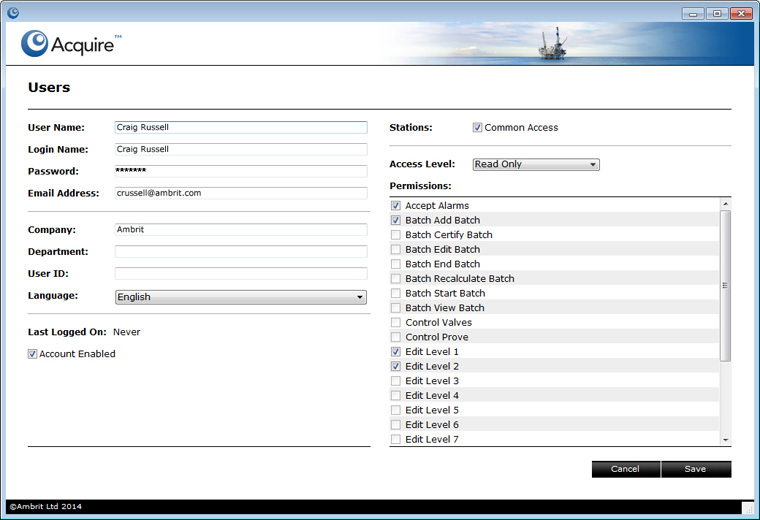 Flow computer reports, tabular reports and styled reports are automatically downloaded from the flow computers and stored in the Acquire™ database. Reports can be printed, archived or sent via email. 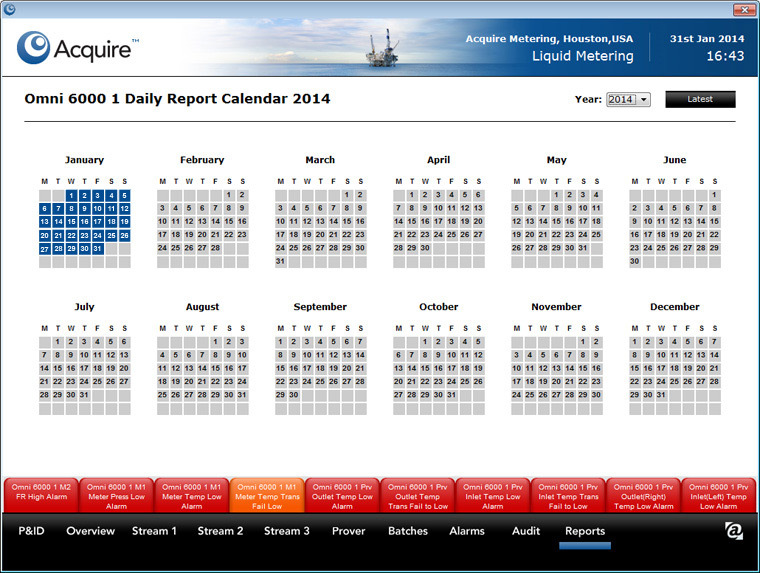 Easily find archived reports by selecting them from a graphical calendar. Springing onto the screen whenever a new alarm occurs and accompanied by an audible alert, Acquire™ quickly makes it obvious that there has been a problem on the system. View and accept alarms or manage alarm notifications via email. 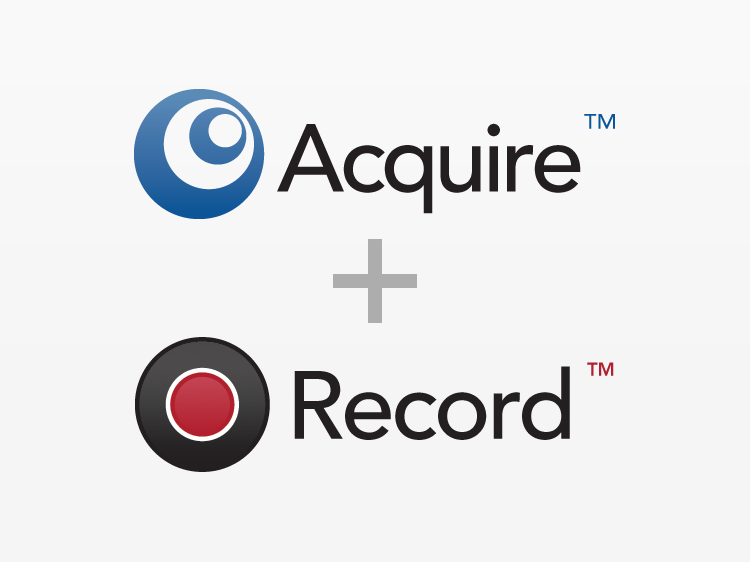 As new events occur in a flow computer, they are automatically recorded in Acquire™. Events from multiple flow computers are chronologically interlaces and instantly searchable. Effortlessly schedule your batches in the flow computer from your browser, then watch as each batch progresses. When the batch completes, Acquire™ automatically downloads the batch report, and stores it in the database. 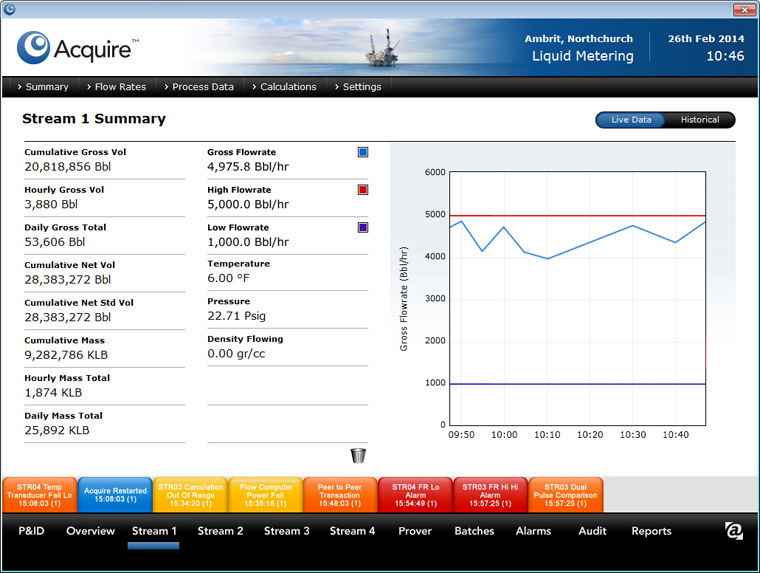 Monitor your tank farm from your browser. 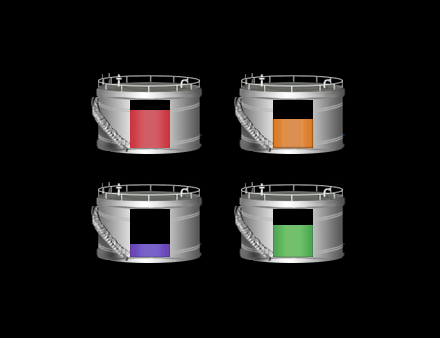 Up to 16 tanks can be displayed on a single P&ID with graphical representation of levels, direction of movement and alarms. Detailed information is also available for each tank. Apply control valves to the system and get fully working PID control logic straight out of the box. 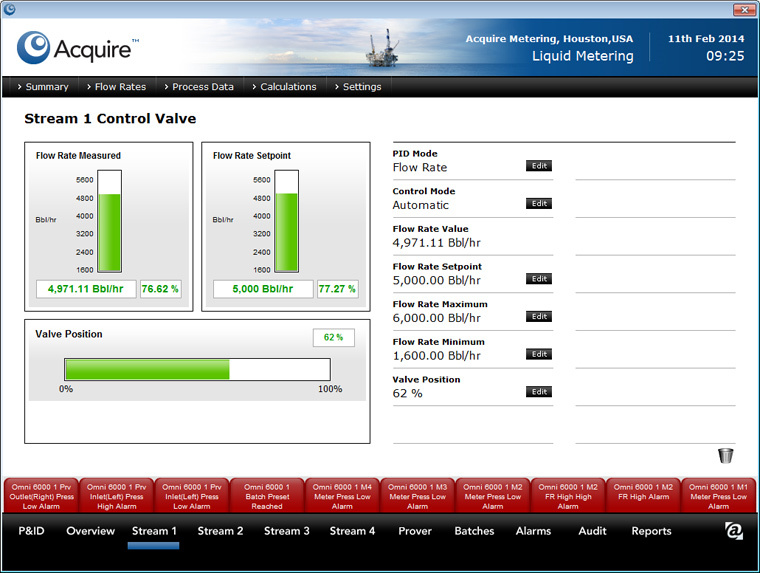 Select the required parameter and then nudge the valve position to incrementally set the flow as exactly needed. Scale Acquire™ far beyond just a single metering station. In fact, a single Acquire server can manage up to 24 flow computers on 24 metering stations and up to 96 meters runs in total. IF more stations are needed, just link another Acquire server. 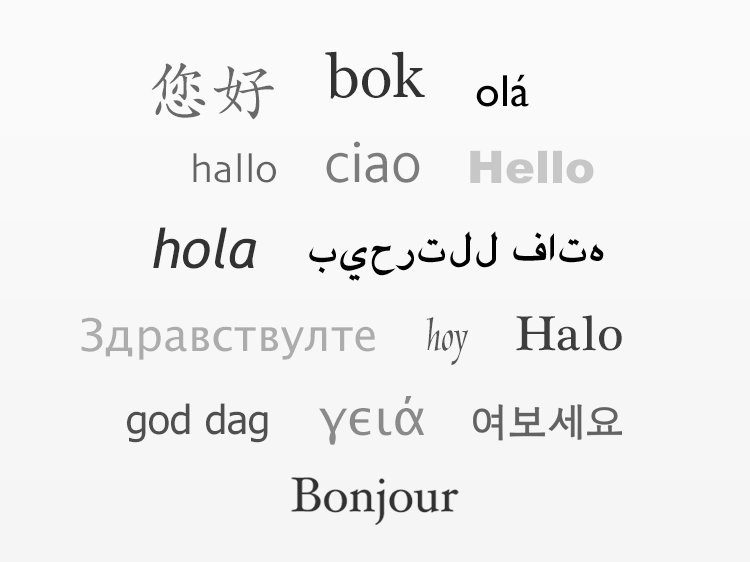 Acquire™ will dynamically translate the interface to reflect the native language of the user, including script languages, such as Arabic, Russian and Chinese. Multiple languages can be used simultaneously. 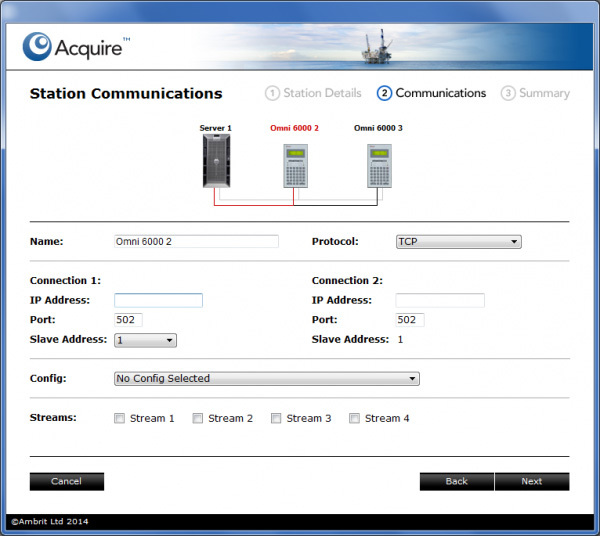 Acquire™ has native support for all major types of flow computers, including Omni Flow Computers‘ OMNI 3000 / 6000 and Daniel S600 / S600+. 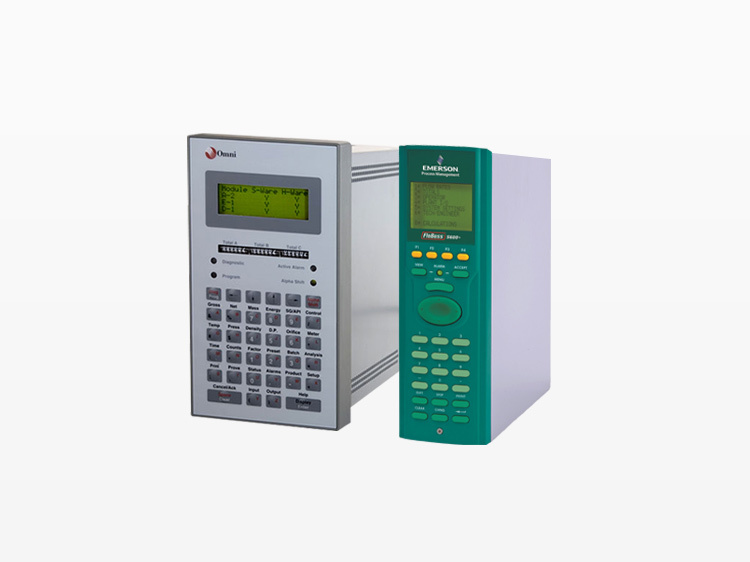 PLCs and smart instrumentation can also be included. 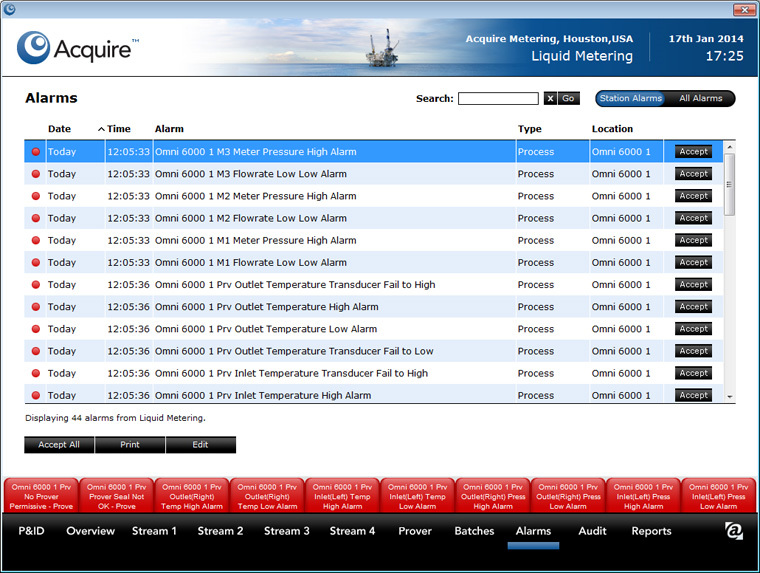 Record important process events automatically in a process logbook along with corresponding meter readings for a full audible history using a built in Record™ logbook. Monitor everything the flow computer does and perform actions based on particular events. Raise alarms, generate reports, notify a PLC or export data an Excel spreadsheet. Events greatly expand the range of possibilities for Acquire™. 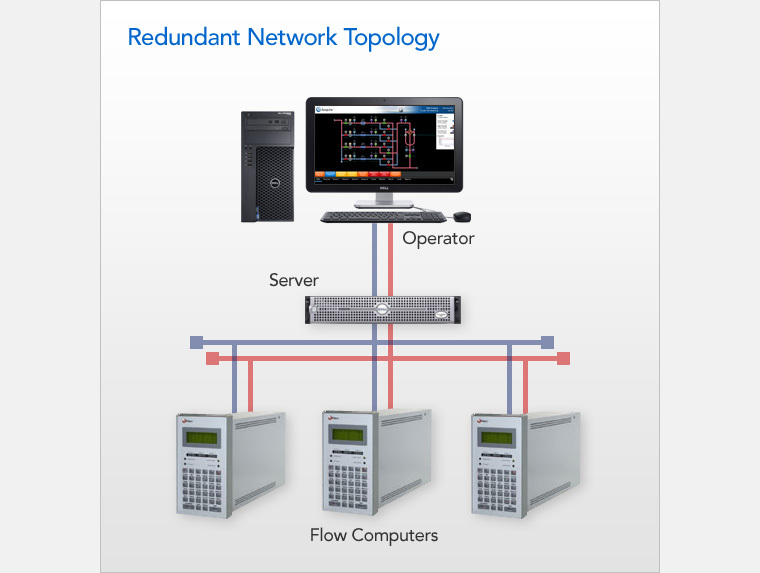 Seamlessly share data gathered from any connected flow computer to other computers using Modbus. Real time data from the field can be sent straight to the DCS. Send and receive flow computer data to and from any OPC client using the built in OPC server. Any real time data from the field can be sent straight to a DCS or even Microsoft Excel spreadsheet. Extend the capabilities of Acquire™ by using the built-in scripting feature to apply formulas to fields from one or more flow computers. Ideal for producing station totals, customised report values or for creating your own alarms. Keep all your flow computers running with the same system for an accurate picture of daily events. 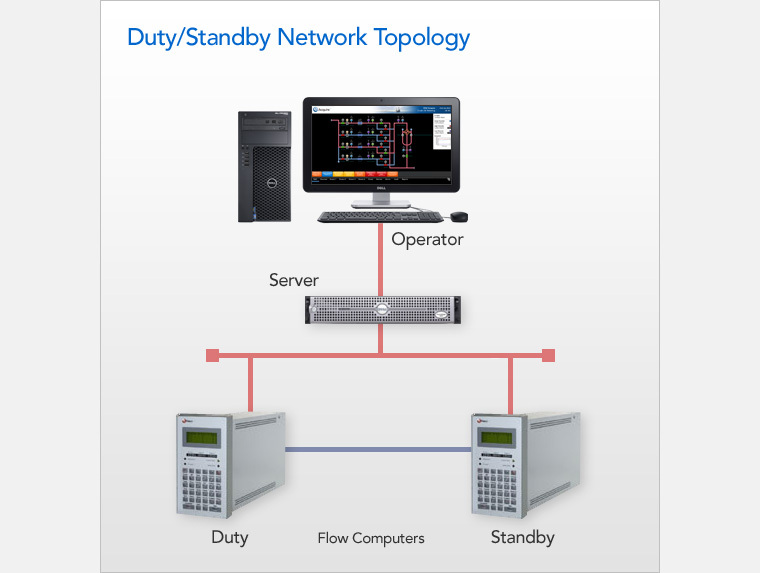 The flow computers’ clocks can be synchronised from the server time, network time or from a designated flow computer.